This scripture speaks about the dying moments of Jesus Christ on the Cross. 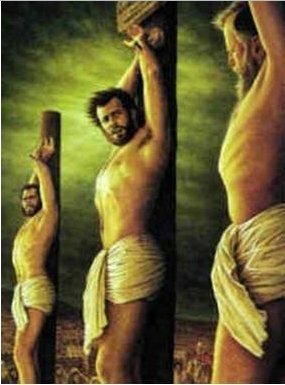 Jesus was nailed to the cross along with 4 other Criminals or Malefactors. This verse is often mis-quoted to prove that Christians go to heaven immediately after death, but this is an incorrect misinterpretation of the Bible. The Bible can be confusing at times. It is easy to misunderstand some of the scriptures, often because of the way they were originally written, or because of slight imperfections in their translations. The idea of Christians going to heaven directly after death had to come from somewhere. Let us explore one of those misunderstood verses in the Bible, that many preachers use to convince people that their loved ones are happily in heaven right now. (Luke 23:42) And he said unto Jesus, Lord, remember me when thou comest into thy kingdom. (Luke 23:43) And Jesus said unto him, Verily I say unto thee, To day shalt thou be with me in paradise. In Luke 23:43, the verse apparently says that Jesus is promising the Malefactor (one of the men nailed on the cross with him) that he will be together with him (Christ) in heaven, on that very same day. I’ll explain why this interpretation is completely wrong without a doubt. I need you to give your FULL Attention to be able to understand what I’m explaining here. First, let’s look at the word “Paradise”. 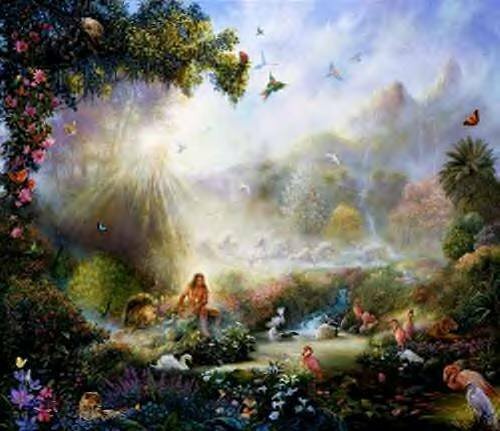 Paradise was translated from the Greek word “Paradeisos“ from the Septuagint (Greek Bible Scriptures). Of Oriental origin; a park, that is, (specifically) an Eden (place of future happiness, “paradise”): – paradise. Paradeisos appears twenty-eight (28) times in the Septuagint. 21 of those appearances refer to the Garden of Eden. 7 of those appearances refer to an ordinary garden. Paradeisos/Paradise refers to a place of beauty and delight upon earth. It NEVER refers to the Heaven where Jesus Christ is seated with God right now. Paradise which existed in Genesis 2 was lost in Genesis 3 by Satan’s intervention and man’s sin. This same Paradise is not available today, nor at the time when Jesus was on this earth. It will only be restored after Revelation 22 is fulfilled, and the last Enemy, Death, is destroyed. (Revelation 22:1) And he shewed me a pure river of water of life, clear as crystal, proceeding out of the throne of God and of the Lamb. (Revelation 22:2) In the midst of the street of it, and on either side of the river, was there the tree of life, which bare twelve manner of fruits, and yielded her fruit every month: and the leaves of the tree were for the healing of the nations. (Revelation 22:14) Blessed are they that do his commandments, that they may have right to the tree of life, and may enter in through the gates into the city. These verses talk about the restoration for Paradise, the Tree of life and all the beauty that was lost in Genesis 2. So we can see here, that Jesus was not referring the Malefactor being in Paradise “Today”, because that place has not been accessible since Genesis 2. Secondly, let’s look at the grammatical aspect of this verse. As most people should know by now, the Bible is not without error. This should not weaken our trust in the Bible; however, we should be aware that small and unintentional mistakes can be made, when translating the Bible from it’s original Hebrew and Greek literature, to other modern languages, such as English. 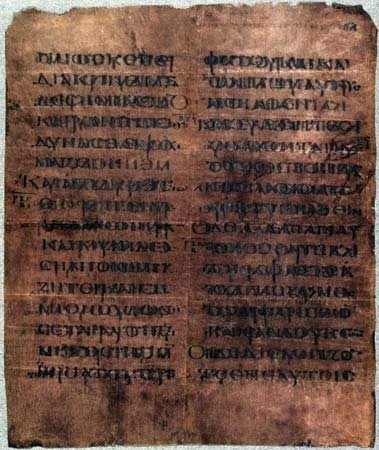 The original scriptures of the Bible did not have Punctuation marks. Punctuation was added by translators to structure the sentences to our way of writing. Thus, punctuation marks could have easily been added in the wrong places, which in turn changes the meaning of a sentence very easily. Greek language did not have punctuation in their writings. It makes it seem that Jesus is saying the Malefactor will be with him in heaven that very same day. We already know that this contradicts what the Bible says about Christ’s return for us. A simple repositioning of the comma changes the meaning of the sentence. This simply adds emphasis and conviction to Jesus’ statement. “I’m saying to you right now” – This is what Jesus means to say here. This phrase of emphasis appears many times in the Bible. (Luke 23:43) And Jesus said unto him, Verily I say unto thee To day, thou shalt be with me in paradise. This makes proper sense in regards to Jesus’ promise of his return for us. Lastly, let’s look at what actually happened on that very day. As most of us know, Jesus died on the cross that day. Then, he was laid in a Tomb for 3 days and 3 nights; not so? Jesus “passed away” that day, he was in gravedom. (Matthew 12:40) For as Jonas was three days and three nights in the whale’s belly; so shall the Son of man be three days and three nights in the heart of the earth. He most certainly could not be in Heaven or Paradise on that day; don’t you agree? So with this in mind, how could Jesus Christ, our loving saviour and the purest person that ever lived, tell a big LIE like that to the Malefactor? Jesus is NOT a liar, Satan is a liar, and the father of lies, not our Christ. 1) Paradise has not been accessible since Genesis 2. 2) Incorrect punctuation by translators led to a change in the meaning of Luke 23:43. 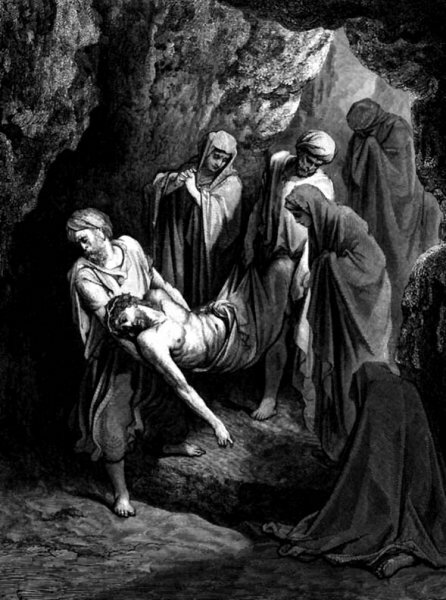 3) Jesus died on that day (of Crucifixion) and was in gravedom for 3 days before going to Heaven. Thus he could not possibly be in Heaven or Paradise with the Malefactor on that day. Therefore, without a doubt, we should be able to understand what Jesus was really saying on that dying moment on the Cross. Verily I say unto thee To day, thou shalt be with me in paradise. Jesus promised the Malefactor in that moment, that he will be with Jesus in Paradise one day, when that beautiful place is restored. After Death, the final enemy is destroyed, they, together with us born-again Christians, will be able to enjoy eternal Paradise together. Thank you for sharing this Bible truth. I hope many people read this! Keep up the good work. How about the fact that Jesus was crucified on Wednesday and not Friday? Yes, I do hope that many people read this very important teaching. I will look further into the exact day of the week that Jesus was Crucified, and will probably write about it as a separate teaching. I’m not sure which part of this teaching you do not understand. The popular belief amongst many Christians, is that when we die, we immediately go to heaven. Luke 23:43 is often used to “Prove” that; but this verse is mis-understood.